Original Colored Portrait Commission. 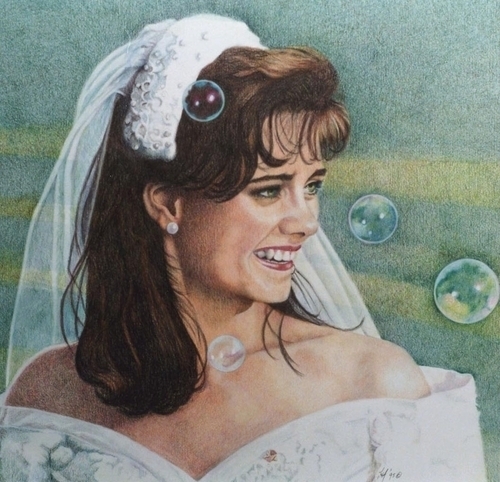 This portrait was rendered with a wide range of colored pencils. All portrait commissions similar to this will be drawn from photographs supplied by the buyer and done on archival art paper. It would be nice if you could send me lots of images of the family member and a written description of personality, color of eyes, likes and dislikes. Delivery should be within 4 weeks. You also have the option of having giclee prints made of your portrait to share with family members. Each print will include artist signature. The image can also be used on the face of a greeting and personalized as you wish. I want to create a family heirloom for you. Please contact artist to start the process.